Not only will 2005 Topps Finest Baseball include exclusive autographed cards of superstars Barry Bonds and Alex Rodriguez, but will also feature signatures of 2004 All-Star Game MVP Alfonso Soriano, all-new Met Carlos Beltran, world champions Pedro Martinez, Curt Schilling, David Ortiz and Kevin Millar, future star David Wright, N.L. Rookie of the Year Jason Bay, pitching star Johan Santana, the best closers in the game - Eric Gagne and Mariano Rivera and super stars Gary Sheffield and Eric Chavez. Throw in another 16 Autographed Rookie Cards including top prospect Billy Butler and you have a product with an autograph list that is second to none. And this year, Finest guarantees an autographed card in every mini-box - that's THREE autographed cards in every master box! 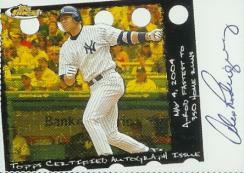 2005 Topps Finest Baseball ships the week of May 2nd and carries a $150 SRP for each Master Box.